My older son is still having problems related to writing. Not that he can’twant to write, and has trouble sitting still long enough to write much. After getting the OK from his teacher to try letting him type his journals instead of writing them, my wife has been looking at typing tutor software. Looking around on my own, I found this cool looking Flash-based typing game called Word Shoot. 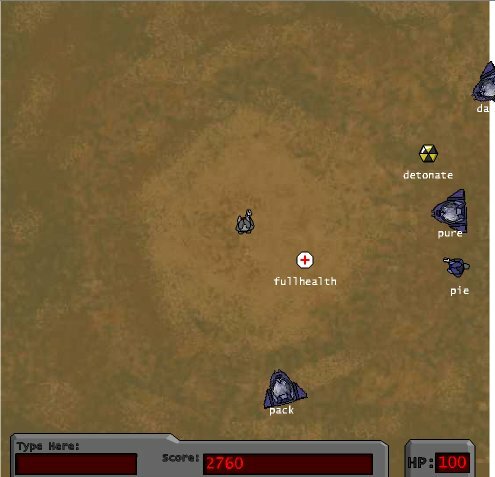 You stand in the middle of a battlefield of sorts and type words on approaching enemies to shoot them down. Just the kind of thing my son might enjoy, and on the easy level it starts out slowly enough that he might be able to get a few enemies before getting overwhelmed. Sort of a typing-tutor by fire thing. Damn this game is fun. I am a self-taught touch typist. I know that certain fingers do the letters that the other hand is suppose to do. Anyway, this is a once a day “get away” / habit for me now.